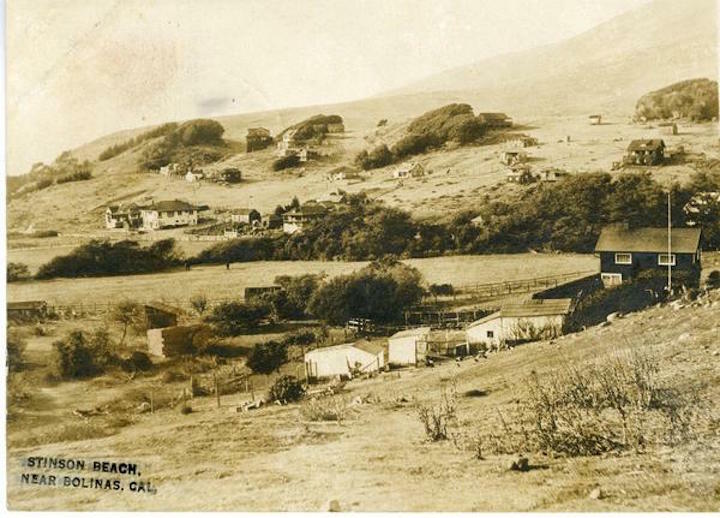 A postcard showing Stinson Beach in the early 1900's. History and photos courtesy of the Stinson Beach Fire Protection District. FD history researched and written by Tamae Agnoli. Special thanks to Bill Lellis of the Marin Fire History Group for his visit to Stinson Beach and collecting this information. Prelude and context - about Stinson Beach. Edited overview from Wikipedia. Stinson Beach is located in West Marin County, California, on the west coast of the United States. The community is 2.5 miles east-southeast of Bolinas, on California's Highway 1, at an elevation of 26 feet. The population of Stinson Beach was 632 at the 2010 census. It is near popular public attractions such as Muir Woods National Monument, Muir Beach, and Mount Tamalpais. It has a long beach, where the cold water promotes fog throughout the year. Stinson Beach is a popular day trip for people in the San Francisco Bay Area and for tourists visiting northern California. Although most visitors come by car, Stinson Beach is linked to Marin City by a daily bus service, and the network of hiking trails around Mount Tamalpais also reaches the town. The beach is one of the cleanest in the state, and sandy, unlike the rockier neighboring beach in Bolinas. It attracts thousands of people often seeking relief from inland heat. Nathan H. Stinson bought land at the site in 1866. In 1870, the ﬁrst road was built along the coast from Sausalito, and a tent settlement sprang up in the willow trees at the beach, which gave rise to the town's original name, Willow Camp. The Mt. Tamalpais & Muir Woods Railway operated from 1896-1930, making Willow Camp more accessible until paved roads were completed. Visitors could ride the train to West Point Inn and then hike or arrange a stagecoach to take them to the beach. In 1906, refugees from the San Francisco earthquake came to the area and built some of the area's ﬁrst businesses. Stinson Beach became the ofﬁcial town name in 1916, in honor of the largest landowners, Rose and Nathan Stinson. In 1939, the beach was sold to Marin County. It was transferred to the State of California in 1950, and was eventually transferred to the National Park Service in 1977. The surf off Stinson Beach is within an area known as the Red Triangle, where there have been an unusually high number of shark attacks. Marin County added 12 tsunami-warning signs to the Stinson Beach shoreline in 2012 to explain the risk to beachgoers. On the second Sunday of June, the town serves as the ending point for the annual running of the Dipsea Race, the second oldest foot race in the U.S. The California Road Club holds its Mount Tamalpais Hill Climb, one of the oldest bicycle races in the West, in early fall. Since 2002, the race has been held on the third Saturday of the month, with about 400 bicyclists competing in the 12.5-mile road race from Stinson to the head of Bolinas Lagoon and on to the West summit of Mount Tamalpais at Rock Spring. "Cuisine On the Green" is a yearly event benefitting the Community Center held in May in the town's central park, The Village Green. It features local restaurants and merchants selling a wide variety of foods and novelty items at different booths. Talent local to the area often performs on the park stage. Cuisine. On July 4th of every year, a "tug-of-war" is held with Bolinas across the inlet dividing the two communities. 30 women from each shore pull against each other until a winner is declared, then 30 men from each take their turn. George Hunter White, also known as Colonel White [1965–1975], Fire Chief, Federal Bureau of Narcotics agent and District Supervisor, retired. He was an OSS Counter-Intelligence Director during WWII; led Project MKULTRA in Boston and Operation Midnight Climax in New York and San Francisco brothels (or "safe houses") until the closure of the San Francisco facilities in 1965. Peter Bishop Allen (November 1, 1943 – June 3, 2004) [c. 1967–2004], sculptor of marine mammals; served as Assistant Chief, Stinson Beach Fire Department; and was the founder of The Kids Camp nature education center and programs. Elmer Collett [1966–present], retired professional football player for the San Francisco 49ers and the Baltimore Colts, and also a retired Firefighter for the Kentfield Fire Protection District. The closest mutual and automatic aid fire partners are, to the west, the Bolinas Fire Protection District, to the northeast up on the mountain, the Throckmorton Ridge Station of the Marin County Fire Department, and to the south the Muir Beach Volunteer FD. The men and women of action, the volunteer firefighters of Stinson Beach, did not leave us many written documents. What we can find are mostly from annual reports made to the Community Center Inc. since its incorporation in 1947, reports and business mentioned in the Stinson Beach Progressive Club minutes which run from 1930 to 1973, and oral histories of "old timers". The oldest document we have is a letter written by the Stinson Beach Fire Department in September of 1928 addressed to the Stinson Beach property owners. It tells us when (1921) and how the fire department was most likely established and that the Fire Department is the first organization established in Stinson Beach. "In 1921 property owners of Stinson Beach who had buildings on their property contributed to a fund for the purchase of fire extinguisher apparatus, some ranging $10.00 to $250.00 were contributed." Very effective chemical equipment was obtained, which has on several occasions saved the town from a serious fire loss. Sufficient money was not available to mount this chemical equipment on a chassis with its own power. Consequently, it has been necessary to tow it with an automobile except on level portions of the town site. This has been a serious obstacle on several occasions, and it is most apt to at some time render the equipment of no value, particularly in the winter when the streets are wet and muddy. Then, too, very few people care to risk hooking a good car to it, and others would not know how to even if willing to risk damage to their car. For lack of funds, this apparatus has had to be left standing out in all kinds of weather, with the result that while the chemical engine itself is in nowise injured, the two-wheel carriage on which it is mounted is in bad repair”. The letter goes on to state that they found an automobile chassis suitable for conversion into a fire truck on which to mount the chemical and other equipment, and had an offer of a suitable location for the Fire House. Finally it asks all non-resident owners who had previously contributed to give $10.00 and who had not contributed previously to give $25.00 by check payable to Frank Airey, the treasurer. This first firehouse was located on the upper-most part of the Airey store property at Highway 1 and Calle Del Mar. ".... the Fire Truck in those days didn't start very easily so my parents donated... .the top part of our property ...So you'd push the fire truck out the door headed down hill and hope that the momentum would get it going. Even if the fire was up the hill you went down the hill to get started," Hal Airey, son of Frank Airey, remembered in the oral history he gave. We don't know who was chief at this time, but we suspect it was Frank or Frank's uncle, Jack Airey, who owned the Sea Beach Hotel on Highway l. We know William Airey, who inherited and operated the hotel, spoke as representative of the Fire Department since 1941 at the Progressive Club meetings and named as Fire Chief by 1947 when the planning for the new firehouse was started. In a 1934 letter to the community, the department called again for $2.00 per year per house to meet the expenses of repairing trucks and equipment saying, "Hereafter the Fire Department will be run on a business basis with a regular financial report submitted showing receipts and expenditures." 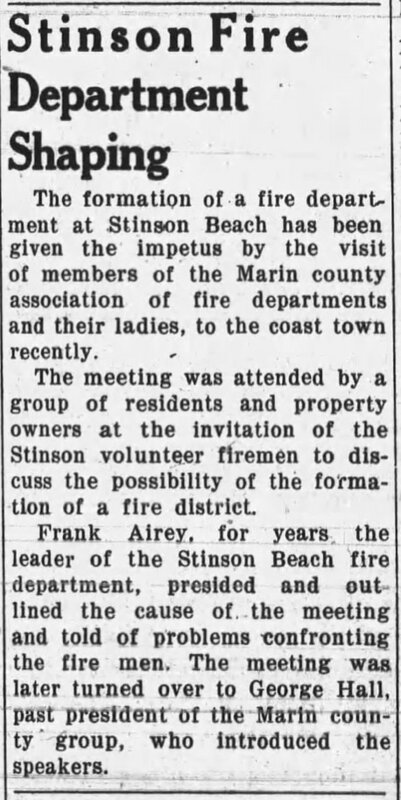 In July 1938, the formation of the Stinson Beach Fire Protection District was voted by citizens, and three men were subsequently elected as Fire Commissioners. The expense of the Volunteer Fire Department began to be supported by property taxes. The sum of $438 was collected in its first year. In May 1939, the Fire Department asked the Progressive Club to find "a place to put the fire engine more or less permanently." A couple of locations were pursued, but nothing happened until 1947. The Volunteer Ambulance Corps was probably started as a combination of the first aid station and the volunteer lifeguard. In February 1938, a Red Cross first aid class was held at the Seadowns Resort (near present GGNRA Lifeguard Station) for 15-25 locals, and a plan to have a first-aid station at the location was announced at the Progress Club meeting. In April 1941, seven men started volunteer lifeguard services directed by the Progressive Club's Lifeguard Committee, and in June, the club donated $30.00 to build the first Lifeguard Tower in front of the old Dipsea Lodge (near GGNRA's main bathroom building). The American Red Cross gave them supplies and uniforms. The current Volunteer Ambulance Corps was established in 1962. Today it is the only volunteer ambulance corps in the Bay Area. The Director of the Ambulance Corps works under the direction of the Fire Chief. About 85% of 150-or-so calls the firehouse received in one recent year were for this corps. The early activities of the department were often supplemented by the Progressive Club's Disaster Committee activities. In 1942, this Committee established the firebreak to the west of Stinson Beach. In 1948, Chief William Airey explained the need for water mains large enough for adequate water flow, and the Club negotiated with water companies to install larger mains. The fire hydrants were installed and painted by the firemen. On May 7,1947, the Community Center was incorporated to receive the gift of the land to build the Community Center complex. The first project was the Fire House. The buildings were built by volunteer labor with materials bought by funds raised by July 4 carnivals. Chief William Airey asked on the Jan. 8-9, 1949 ground breaking of the Fire House that "...every son, brother and husband be on deck." On June 1 that year, the fire engine was moved inside although the electrical works and septic tank field were not yet completed. After the building was flooded in the winter of 1956, the Corps of Engineers changed the course of the stream and built the bridge in front. The building was remodeled and expanded to hold three vehicles in 1970. Fire House No.2 was built by another volunteer effort in 1980. Presently, the Stinson Beach Beach Fire Protection District includes five elected commissioners, a Fire Chief, three Assistant Fire Chiefs, a Medical Director, Maintenance Manager, Secretary and 30 volunteers. Many firefighters do double duty in the Ambulance Corps. In May 2001, Kenny Stevens became Fire Chief, inheriting the reins from Kendrick Rand who served 25 years.